An evening of good food. An asian take on watermelon bites! 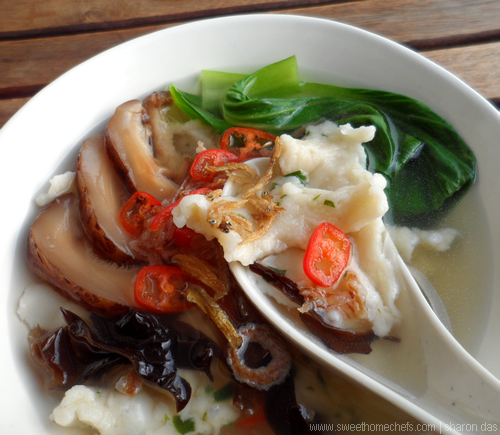 Add a twist to sweet and sour fish! Cute cookies for the festive season! My feelings exactly. 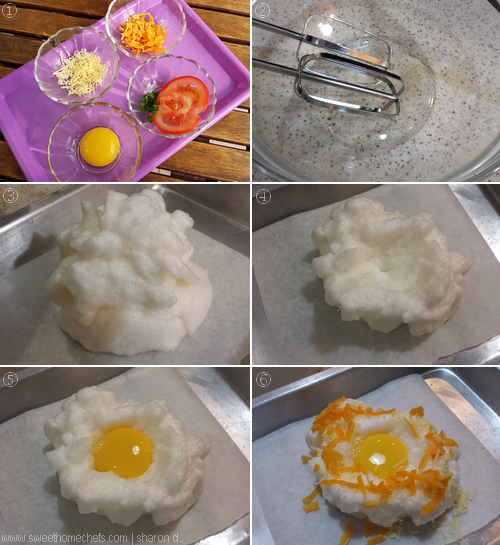 Cottony white cloud eggs are, I daresay, the stuff of foodie dreams from the enthusiasm I saw sweeping Facebook and Instagram a couple of months ago. I don't know if it's still a thing online but we love it here. My husband is an egg-loving person so it was something I had to try. Variety is the spice of life, right? 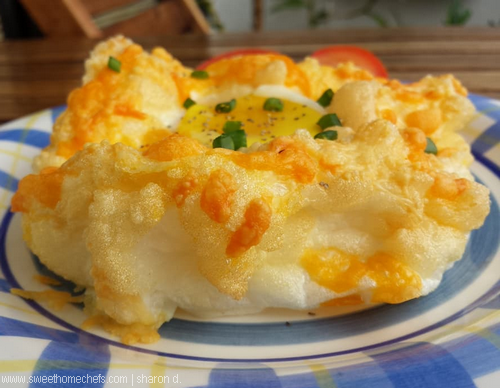 Poached eggs, fried eggs, soft-boiled eggs, now cloud eggs. 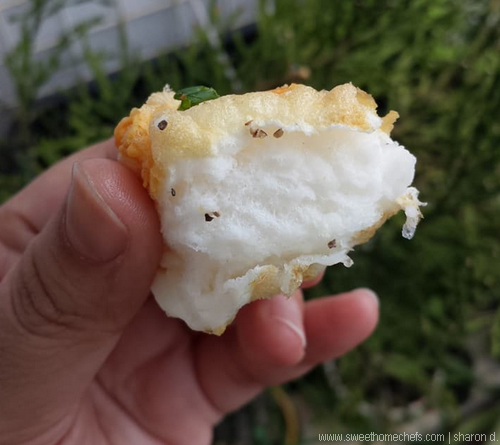 Imagine biting into a savoury marshmallow - the best description I can come up with to give you an idea what this tastes like. Would you believe that it's easy to make? 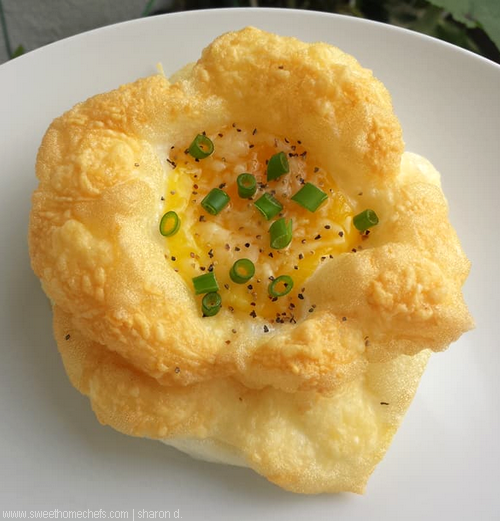 A hand mixer and an egg is all that is needed to create this. For taste, I top mine with cheese. It goes into the oven for awhile and voila! 1) Separate egg white from yolk. 2) Using a mixer, beat egg white until stiff and fluffy. 3) Pour the beaten egg onto a baking tray lined with baking paper. Use a spoon to gently spread the top of the egg white to make a hole in the center, for the egg yolk to sit in. 4) Slide the yolk in. Sprinkle cheese over. 5) Bake in a pre-heated oven for about five to seven minutes until lightly browned. 6) Serve with a pinch of black pepper and the tomato. Garnish with chopped spring onions. 1) Cheese, Tomato, Egg Yolk, Spring Onions. 2) Beat egg white until stiff and fluffy. 3) Transfer egg white onto baking tray. 4) Make a hole in the center. 5) Slide egg yolk into the middle. 6) Sprinkle with cheese and bake! There you go, a delicious cloud egg. Here's one I made with just some Old Holland cheese sprinkled over. A shortcut meal born out of a chilly day with dark clouds and dimmed sunlight streaming through. I heeded the call for quick comfort food to soothe my growling tummy and match the quiet mood. Nothing complicated, I told myself as I pictured me slurping on a hot bowl of creamy soup in my mind. It was a lazy day. I flipped the kitchen cabinet doors open. There it was - a can of Cream of Mushroom soup staring back at me as though it knew what I was craving for. Pick me, it whispers. Oh, my imagination when I'm hungry! I reach out for it and the Top Shell I'd gotten from a hamper; there began my cooking adventure. A bit of pasta, flat-leaf parsley and what I call the Chinese Bacon aka lap cheong completes the dish. The saying 'less is more ' cannot be applied to cooking surely. I think onions would make a nice addition? 1) Cook pasta according to packet instructions or to preference. Keep aside. 2) Use a deep pan. Pan-fry lap cheong without oil until lightly charred. Remove from pan and chop finely. Leave aside. 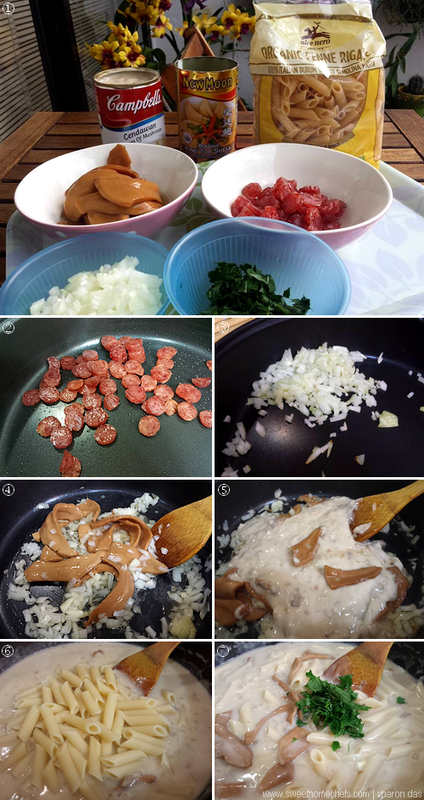 3) Using the same pan, now left with a little oil from the lap cheong, saute the onions. 4) Add top shell and stir-fry for a bit. 5) Pour in cream of mushroom soup. Then, fill the can to the top with water. Pour the water into the pan. Stir until well combined and simmering. 6) Add the pasta. 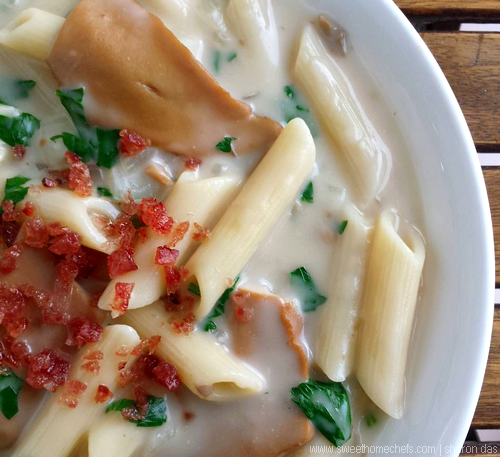 Stir until the pasta is well coated, inside and out. 7) Finally, switch the heat off and stir the chopped parsley in. 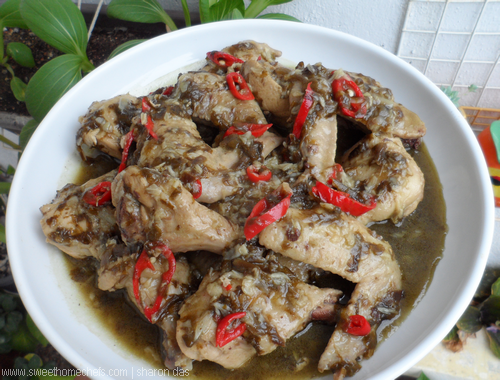 8) Serve sprinkled with chopped lap cheong. 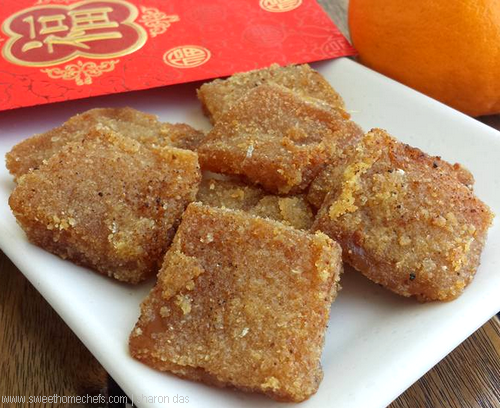 For many Chinese, the Lunar New Year is celebrated with food that carries an auspicious meaning. For instance, uncut noodles represents 'longevity'. Hence the tradition of eating Mee Sua, in my family at least, on the first day of the New Year. It is to wish all of us a long life. 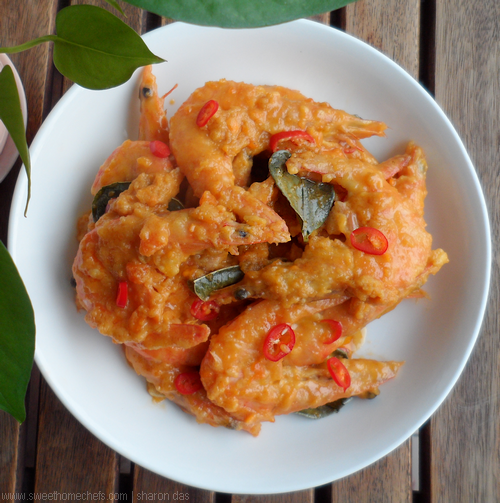 You must be wondering why I call these Prosperity Prawns. It's because I'm serving 8 in a plate. Here, eight is pronounced 'fatt ' in Chinese which means prosperity. I believe one of the best things about Chinese New Year is the fanciful names you'll hear for the dishes which is always about wishing friends and family well. 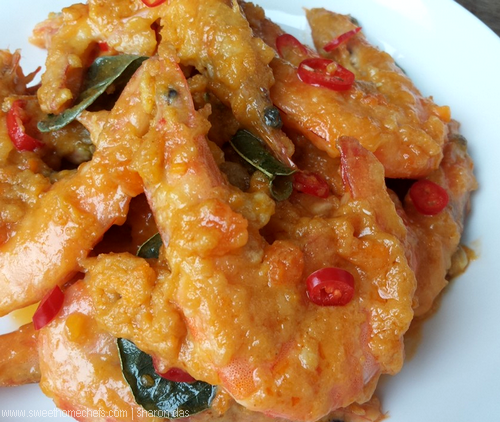 Other than that, I also find prawns to be a great dish to have for reunion dinners because it is red, a mark of happiness and good fortune. In Chinese, prawns are called ' Ha ' . Double it - haha is laughter. Hence, joy. This is one of the many dishes I love preparing because it is easy to do and doesn't take up wok space. I need to use the stove for many other dishes so it is good to utilise all the available cooking appliances for better time management and to ensure food is served hot. I don't believe we should tire ourselves out or stress over important occasions. Therefore, my menu often revolves around simple delicious dishes, with most recipes passed down by friends and family or having run through Mom's old recipes books. Here's what I did but really, there is no need to follow the recipe to the dot. 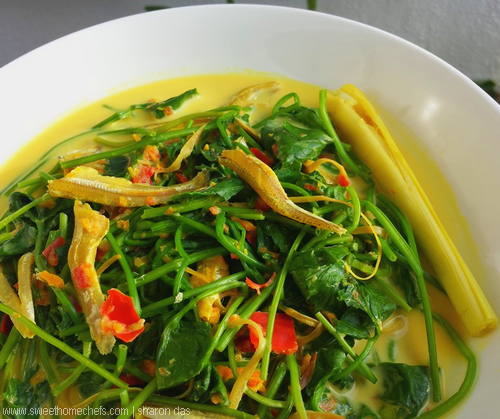 We have always gone the 'agak-agak' (more or less, a rough calculation) way, with several variations from garnishing with spring onions to using Bornean rice wine and more. 2) Line baking tray with foil. 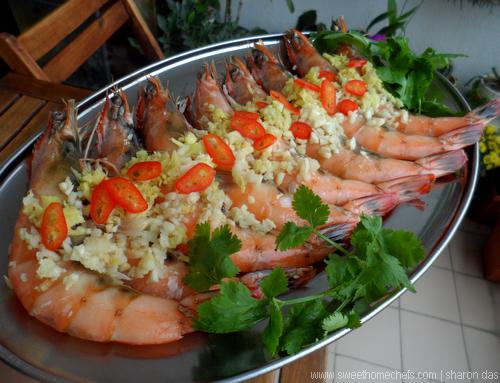 Place prawns on top. Spoon ginger and garlic over. Drizzle with Shaoxing wine and sprinkle some salt over. 3) Cover with foil and bake until just done - about 12minutes for me. 4) Plate. Garnish with fresh coriander and slices of red chilli. There you go, short work. 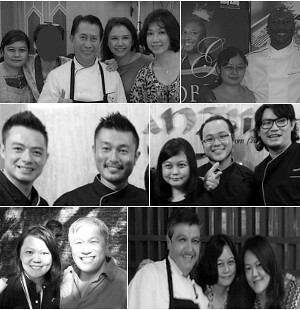 With that, the team at Sweet Home-Chefs wishes you Gong Xi Fa Cai for the Year of the Rooster! 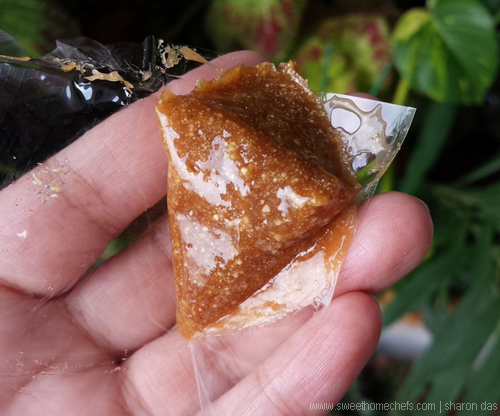 Wajik Sirat is a traditional sweet treat that can be found in many parts of Malaysia. 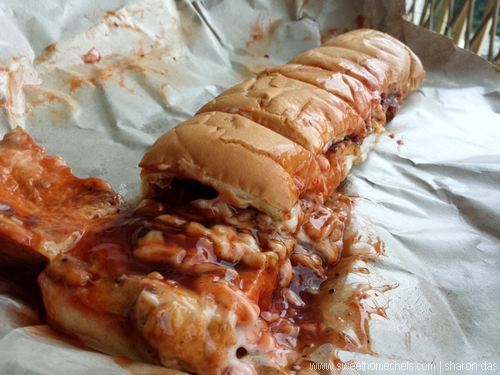 I didn't try it until my recent trip to Melaka where it was abundantly sold in the touristy Dutch Square. The word wajik (Malay) means diamond in English. Wajik, a sticky rice snack, is commonly served sliced in the shape of a diamond. That's where it gets its name. 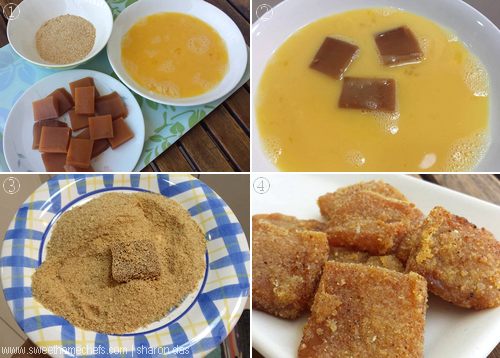 Wajik Sirat is similar to Wajik except that the glutinous rice, instead of being used whole, is ground into coarse powder . 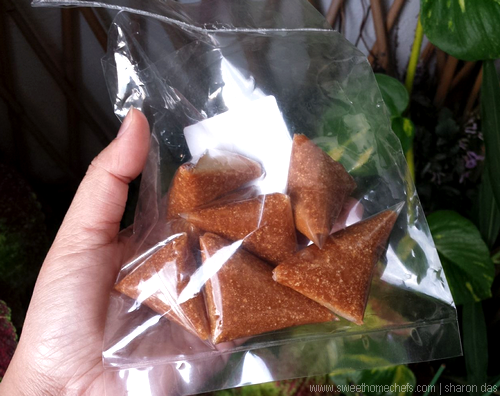 Wajik Sirat is also known by other names such as Kuih Kasirat or Kesirat. A few call it Beras Rendang . There is a risk that treats like these can be too sweet but the ones I bought were just perfect. 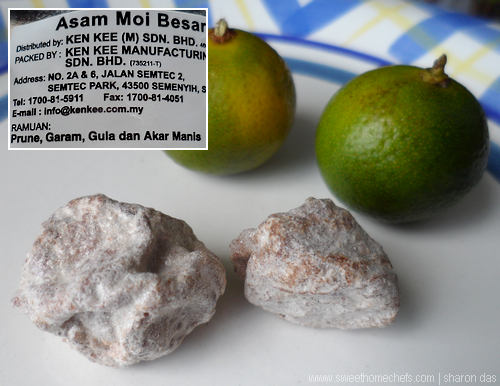 It had the distinct well rounded flavour of palm sugar. The texture was lovely. It was soft but not overly gluey that it sticks to the teeth. 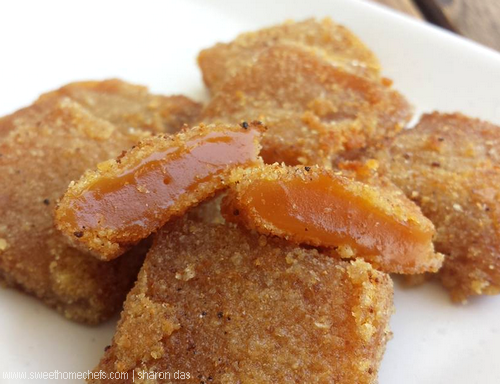 Would you believe that this snack is an easy one to make? 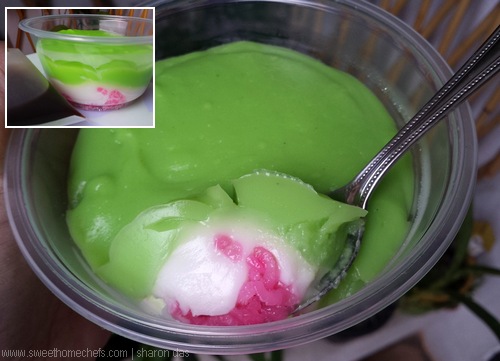 There are slight variations from household to household - some cook it with pandan leaves for a more aromatic take, some use brown sugar, some add a little salt into it, some prefer it with toasted coconut paste and so forth. This is the gist of how it's done. 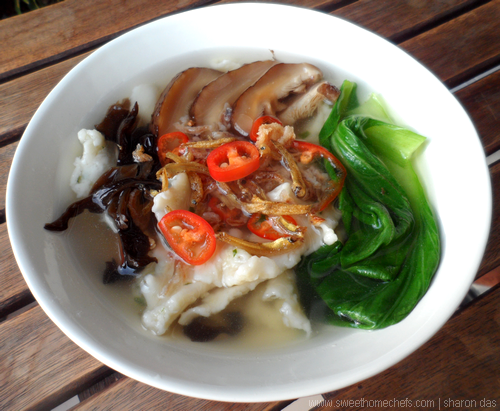 Method: First, the glutinous rice is pan-fried without oil. It is then left to cool completely before being blended into a coarse powder. 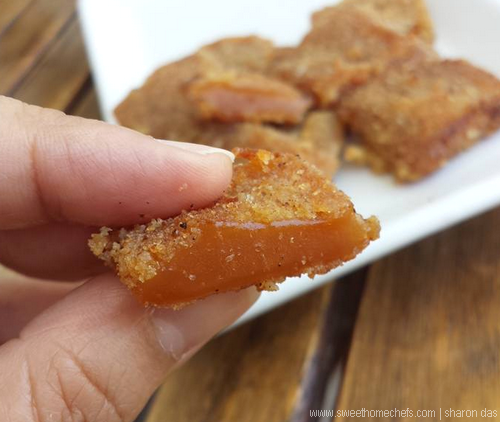 Palm sugar blocks are dissolved with some water in a large cooking pot. The coconut milk is then added. Once the mixture is well combined, the blended rice is added in and cooked into a thick malleable paste that looks like dough. 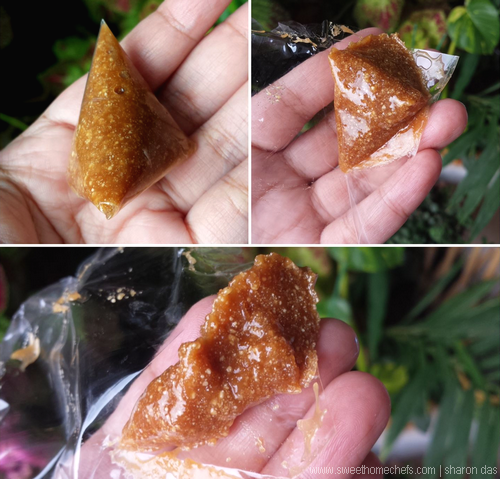 It is then pressed into small containers optionally lined with banana leaf or wrapped in plastic like the ones pictured below. Have you eaten this snack before? Have you ever googled for a 2-Ingredient salad? I did. The results were not quite what I had in mind. Tomatoes and onions? Several other recipes included dressing that required a further 3 ingredients at least! Well, that's not happening here. This really is a 2-ingredient salad. I'm going with lap cheong, a dried Chinese Sausage that is sweet, savoury and packs a punch in any meal. 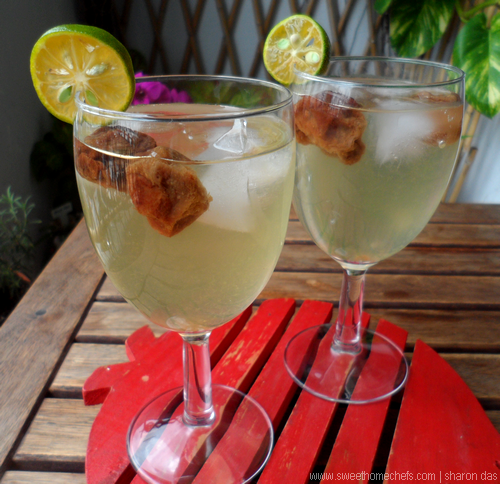 "Lap cheong is a dried, hard sausage usually made from pork and a high content of fat. 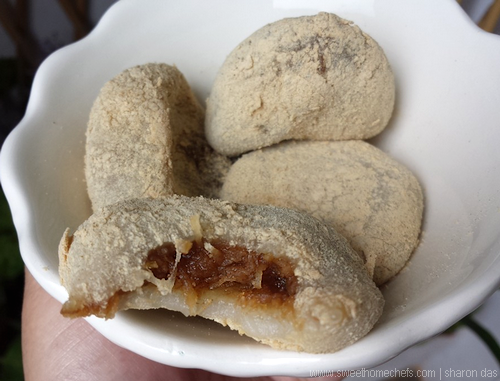 It is normally smoked, sweetened, and seasoned with rose water, rice wine and soy sauce." 1) Heat a non-stick pan up without oil. Dry pan-fry the lap cheong pieces. Do this on medium-low heat as it gets burnt easily. Remove the lap cheong from the pan the moment it's slightly charred. Note: You can use the oil that has oozed out from the lap cheong during pan-frying to do a quick vegetable stir-fry. I do this immediately after removing the lap cheong. 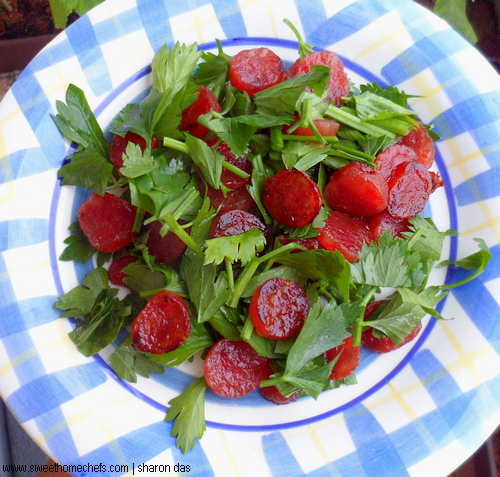 2) Mix and toss with flat-leaf parsley. 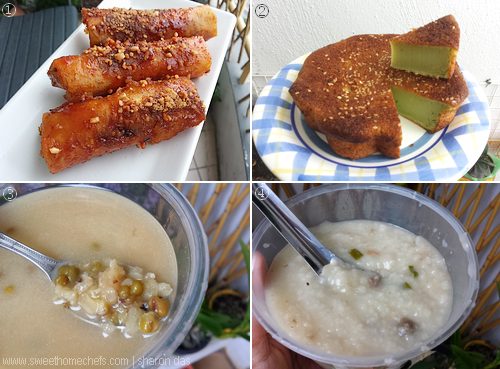 Enjoy as a side dish with rice or congee. 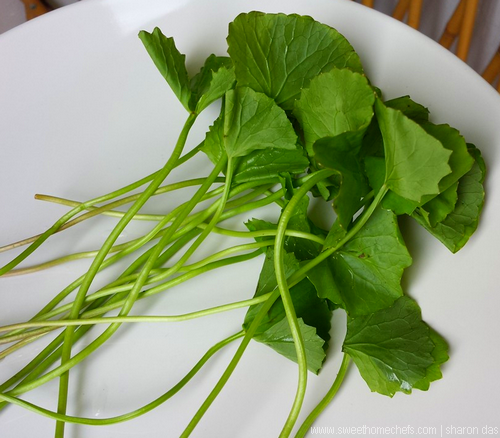 Alternatively, you could use fresh coriander but I find this parsley to be a better contrast of flavour and it stays crunchy for a longer period. 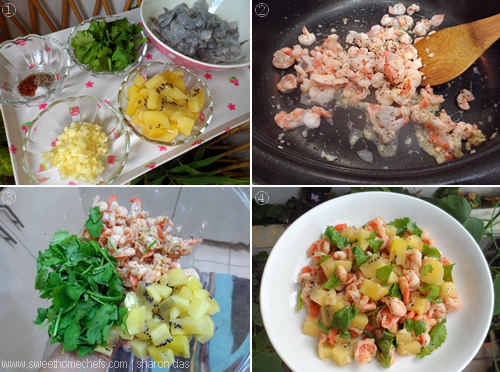 The red, gold, and green sauteed shrimps. Am I too early for Christmas? 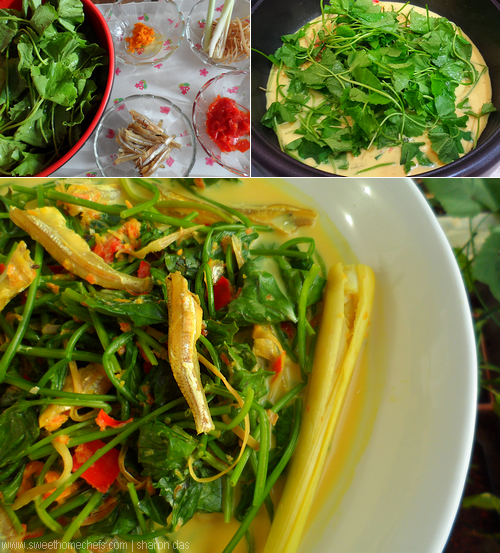 I know I am but the thing is I love festive colours, regularly including green and red into many of the dishes I cook at home - chilli and fresh coriander topping the list of most used ingredients! Hubs popped a packet of golden kiwifruit into our shopping basket one Sunday. I was excited by the yellow colour of the flesh of the kiwifruit, and it wasn't long before I started thinking how nice it would be in some sort of salad. Quick and easy, this is what I came up with! 1) Heat 1 to 2 tbsp cooking oil in pan. Saute garlic until fragrant. 2) Add the shrimps and season with salt, black pepper and chilli flakes. 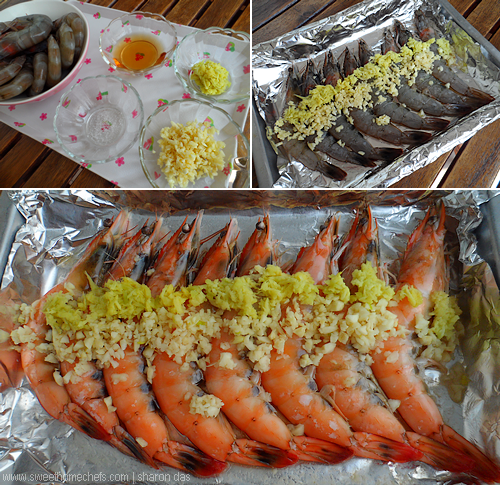 Pan-fry the shrimps until cooked. Then, remove from pan and let it cool for a bit before adding the kiwifruit and coriander. Eat! 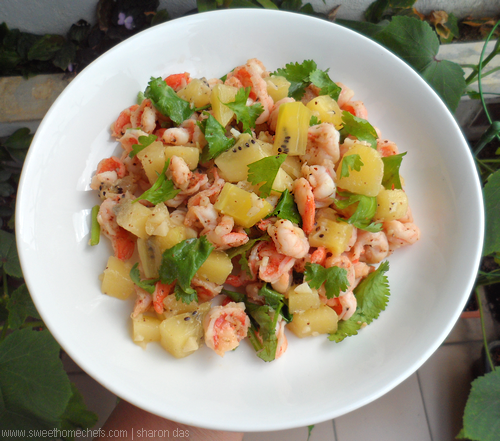 1) Shrimps, Golden Kiwifruit, Garlic, Coriander. 3) Toss to mix. 4) Eat! Red, gold and green - the three colours that make this a visual treat, for me at least. Mangoes make a great alternative. Dragonfruit would be nice too but the flavour would then be subdued. 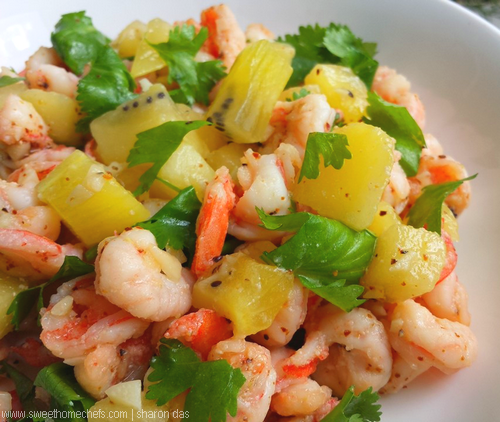 The more intense sweet and sour from the kiwifruit give this dish a kick on the taste buds. I like it! The Hokkiens call it Mee Hoon Kueh, the Hakkas know it as Pan Mee. These are easy handmade noodles that can be prepared anytime using basic ingredients that are found in most Malaysian households. Generally, the Hakkas' method of making this is to cut the noodles into straight flat strands using a wooden block. Hence, the name Pan Mee (Board Noodles). This was how it was done in the old days. 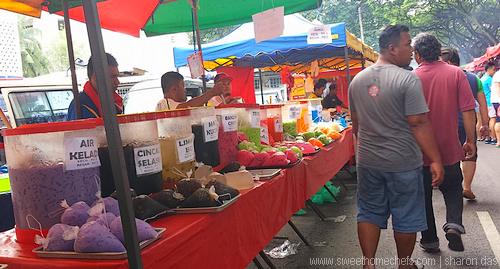 Fast forward now, the term is used less strictly with Pan Mee sellers offering a choice of hand-torn noodles too. 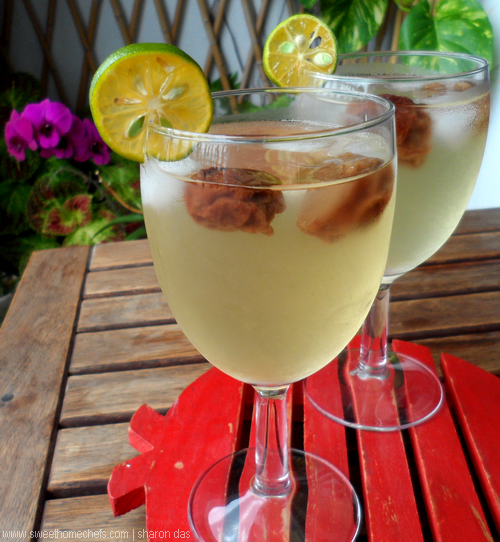 "The current style is a mix between the traditional methods of Hakka and Hokkien. The Hakka initially made the noodle by shaving off a dough, whilst the Hokkien would roll the dough into a flat piece then hand-tear into bite-size." I learnt to make these hand-torn noodles through an old home cooking magazine I was subscribing to in the 1990s, adding my own twist with chopped garlic chives. Lack of a perfectionist state of mind leaves my mee hoon kueh less prettily shaped. However, there was no compromise on the texture and the taste. I conclude - don't worry about how it looks! 1) In a bowl, mix flour, corn flour and salt together. 2) Add the wet ingredients, that is, the egg and oil. 3) Knead into a dough, adding just enough water for all the ingredients to come together. (I added about 60ml water). 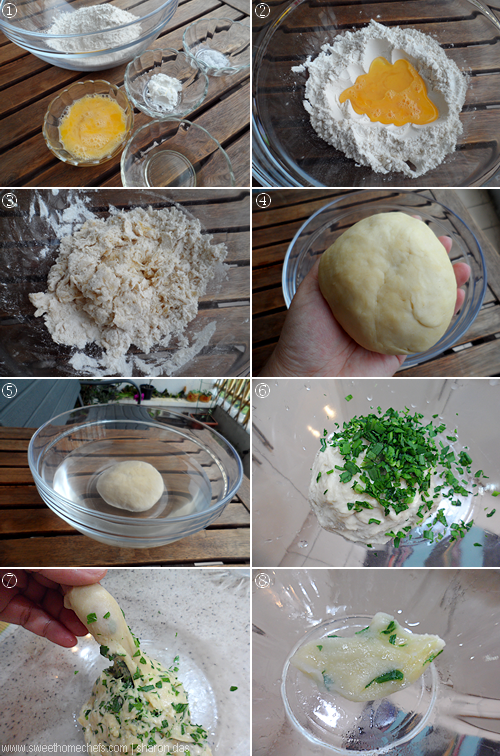 4) Rest the dough for ½ an hour. Optional: Immerse the dough in water for about 4-5 hours to remove some of the gluten in the flour. Pour the water away and rinse the excess flour out by kneading the dough under light running water (no need to be thorough). The dough will be wet and springy. 5) Knead the chopped garlic chives in. The mee hoon kueh is now ready for use. 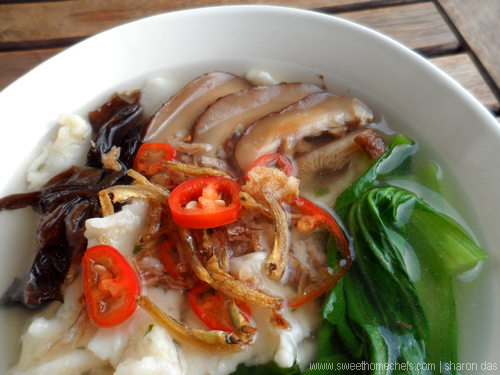 6) Blanch the mee hoon kueh in hot water before adding it into soups. Boil a pot of water. Oil or wet your fingers. Pinch a small portion of the dough into the pot of hot water. Cook for a couple of minutes or more until done. Strain the water away and add the noodles into soup of choice. Alternatively, just cook the noodles together with the soup. 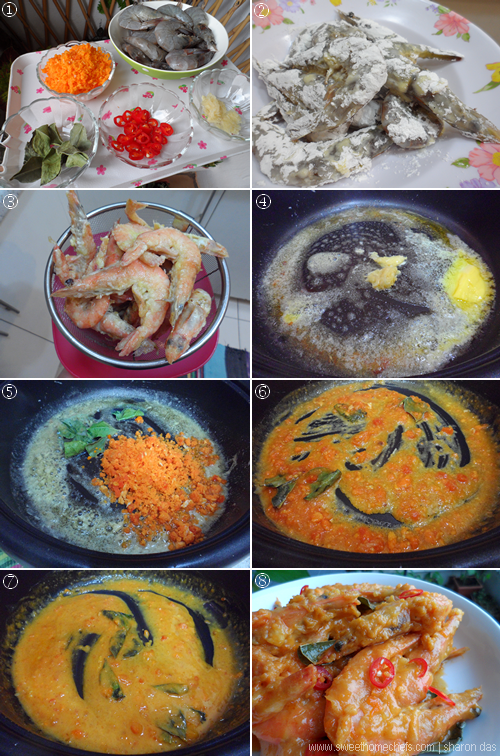 1) Flour, corn flour, salt, egg and oil. 2) Mix dry ingredients with wet ingredients. 3) Use your hand to bring the dough together. 4) Knead. 5) Immerse in water. 6) Add in garlic chives. 7) Springy dough. 8) A cooked mee hoon kueh. Tip: Soup isn't the only way to enjoy mee hoon kueh. 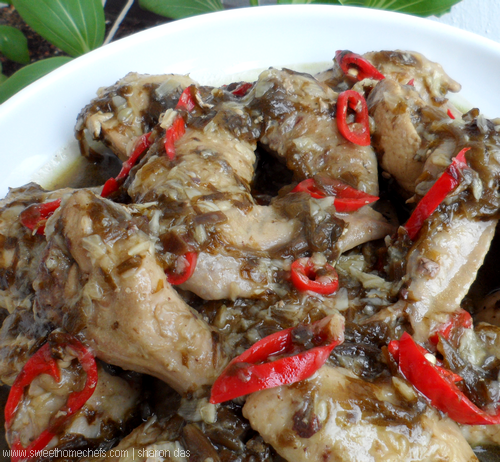 It can be 'dry' (as we call it), flavoured with a mixture of soy sauces and chilli.. I had my mee hoon kueh the typical way, that is, with anchovies soup. For the greens - since I was growing some Pak Choi in my little garden, I plucked a few leaves to go with it. 1) In a deep pot, bring 1.5L water to a boil. 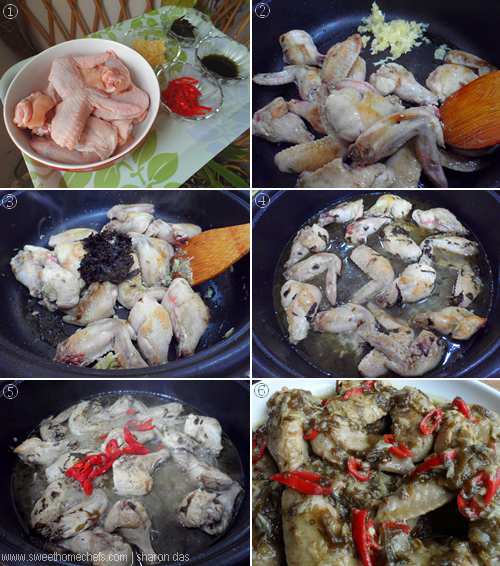 2) Add mushrooms, black fungus and dried anchovies along with a pinch of anchovies seasoning cube. Cook on medium heat for at least 5 minutes. Taste and season accordingly with salt and white pepper. Cook for a further couple of minutes or so to allow the flavours to come together. 3) Finally, stir the pak choi greens in. 4) Place the cooked mee hoon kueh into serving bowls. 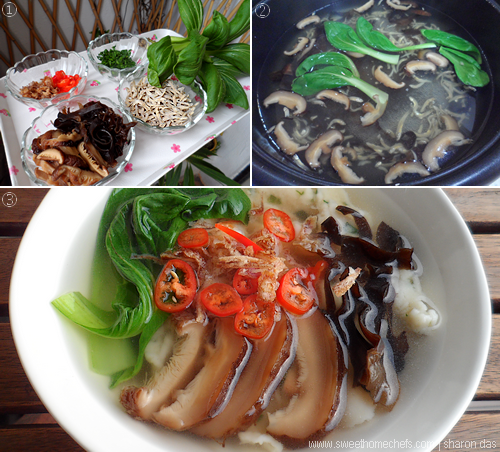 Pour the anchovies soup in along with mushrooms, the greens and black fungus. 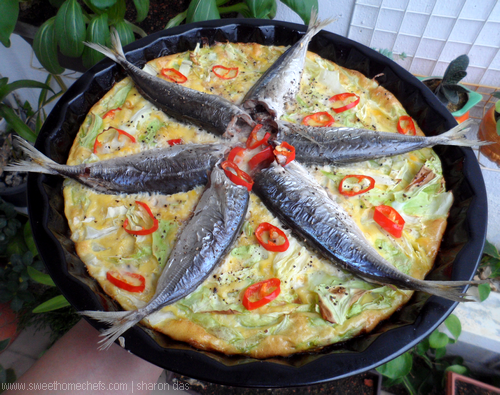 Garnish with fried anchovies, slices of red chilli and fried onions. Note: The soup was done in about 10 minutes. 1) The ingredients for the soup. 2) Boil it all. Easy-peasy! 3) Serve garnished with fried onions, chilli and ..
Garlic Chives Mee Hoon Kueh topped with Crisp Fried Anchovies! There are several mee hoon kueh recipes on the net with small variations in the method and ingredients, mostly made through a perspective of personal preference. 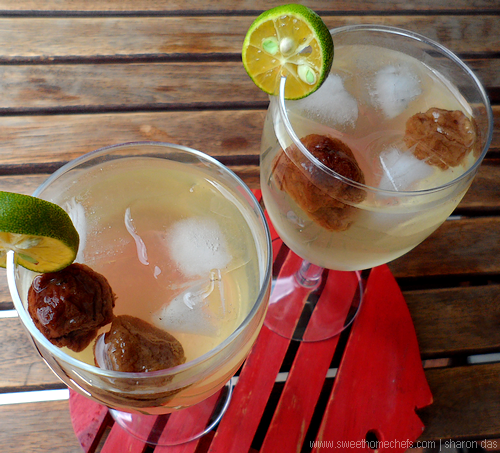 This is a recipe I tried and tweaked out of a magazine and am pleased to report that it rocks! Garlic Chives Mee Hoon Kueh. Eat! It was supposed to be a tart. A dreamy Diana Henry creation of pastry topped with sardines, except that I had planned on adding vegetables and a slice of lemon on the side. As it happened, nothing turned out the way it was visualised in my mind - I didn't have the necessary ingredients on hand. My plans to go grocery-shopping and to meet a friend to drop off the BBQ set I had given away was thwarted by car trouble. The old sweetheart wouldn't crank up. There you go, a kink in my otherwise perfect morning. 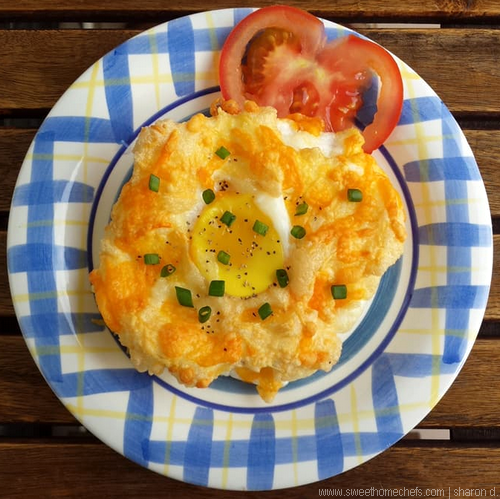 So, eggs were used instead and a sunshiny dish was born to bring cheer to an otherwise gloomy-weather day. Someone said it looked like pizza. Surely a good looking one? 1) Brush cooking oil around the baking dish. 2) Lay the cabbage inside. 3) Beat egg with salt. Pour it around the cabbage. 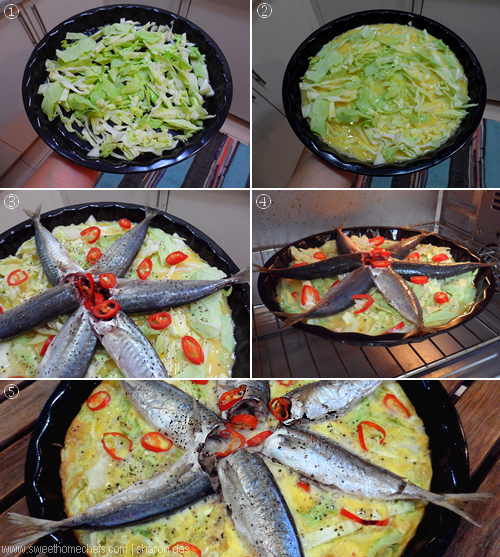 4) Rub sardines with a bit of salt and place on top of egg/cabbage mixture. 5) Sprinkle chilli slices on top and finish with several dashes of black pepper. 6) Bake at 175C for about 25 minutes. 1) Lay the cabbage into the dish. 2) Pour beaten egg over. 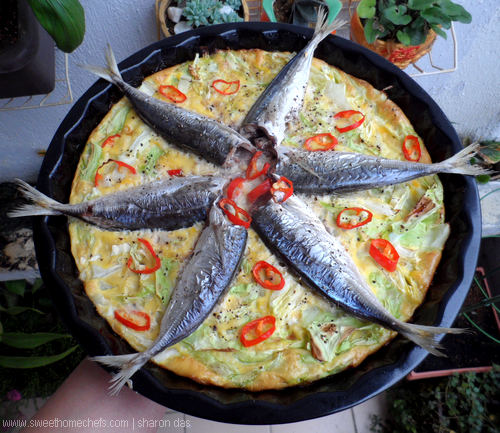 3) Place sardines on top, decorate with slices of chilli and dashes of black pepper. 4) Bake until the fish is cooked. 5) It's done! Best eaten on its own paired with ketchup or sauce of preference. 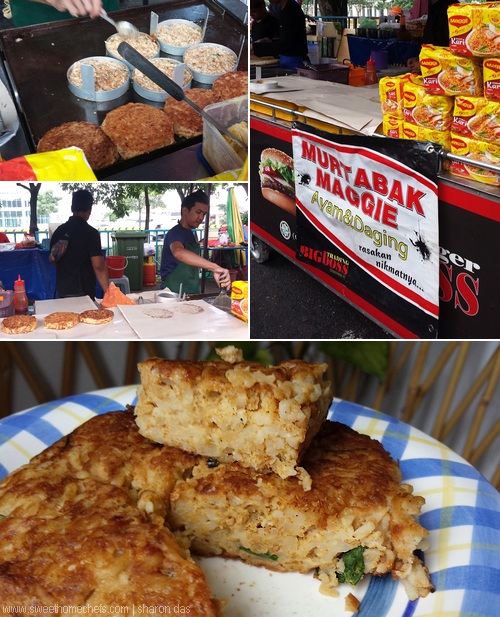 Selamat Hari Raya to our Muslim blog readers! 6 July marks the end of the fasting month for 2016. 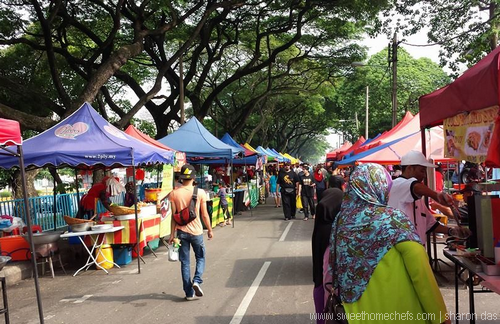 I will miss the vibrant Ramadhan Bazaars that were aplenty in my neighbourhood. 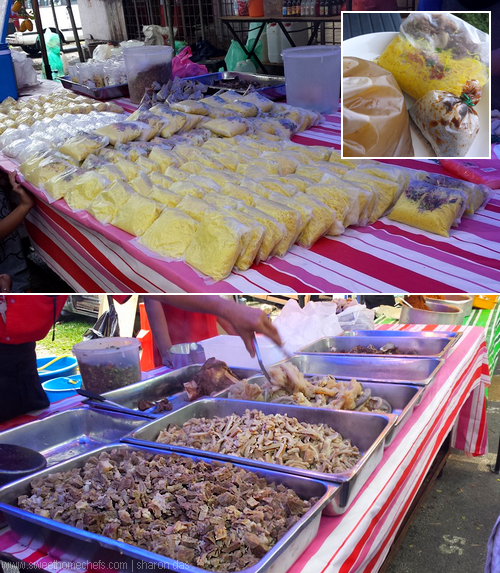 However, the food scene is no less quieter with makeshift lemang stalls popping up along the roadside, Raya cookies and dodol which we received from friends. Lemang is coconut milk glutinous rice cooked in a bamboo stick over an open fire. I'm aiming to get some this weekend. This blog post is nothing to do with local food, however. 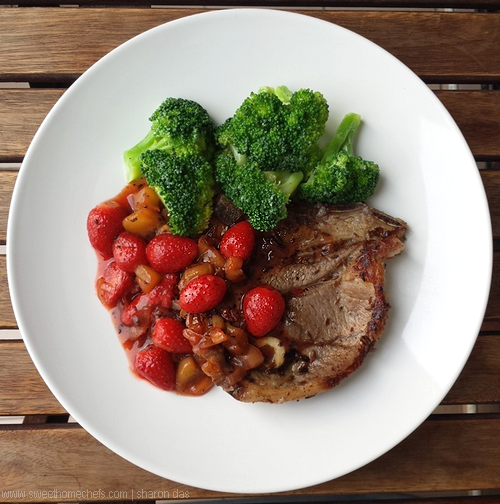 I thought it'd be a nice change to have lamb for dinner after a month of feasting on traditional eats. It was paired with small strawberries which I bought for a bargain at a supermarket. 'Tis the belt-tightening season. Funnily, it's not just about the finances. My waistline is waging a war with burgeoning love handles. That said, I wish I'd gotten more of the strawberries; it would have been beautiful in a fruit tart too. - Some boiled broccoli or vegetable of choice, butter and salt (toss together) . 1) Rub the lamb with coarse salt. Leave aside for about 15 minutes. 2) Boil some broccoli florets in a pot of water. Dunk the boiled broccoli into cool water to stop the cooking process. Immediately toss in butter and a sprinkle of salt. Keep aside. 3) Rinse the salt away from the lamb cuts. Rub on ground nutmeg and cumin seeds. 4) Heat cooking oil in pan. Place the smashed lemongrass into the pan and the lamb cuts on top of it. Pan-fry the meat for a couple of minutes on each side or to a level of doneness of preference. Then, remove the cooked lamb cuts from the pan and leave aside to prepare the sauce. 5) Using the same pan, splash in a tbsp or two of water. Add the onions. Stir-fry it for a bit before adding the kiwi fruit. 6) Cook the kiwi fruit until it looks a little smashed. Add sugar, a little water and a dash of black pepper. Stir to combine. 7) Add the strawberries. Cook until slightly tender. 8) Finally, switch the heat off and stir the corn flour in to thicken the sauce. Add more water if you find the sauce too gooey. 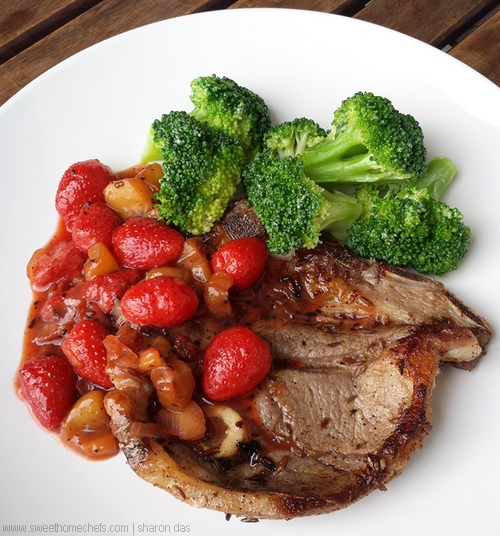 9) Plate the lamb and pour the strawberry-kiwi sauce over. Serve immediately with vegetable of choice. 1) The Ingredients. 2) Pan-fry the spiced lamb pieces. 3) Cook to a level of doneness that is to your liking. 4) Prepare the strawberry sauce. 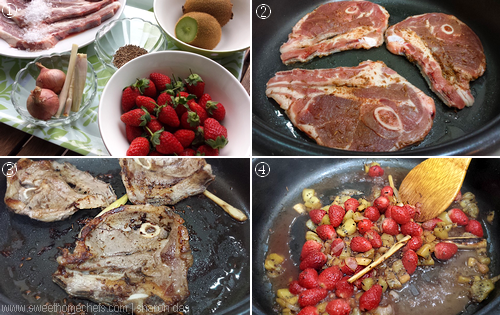 Taste-wise, the tangy sweet-savoury strawberry-kiwi fruit sauce went very well with the salted spiced lamb. I've never been one to shy away from experimenting with new flavours. This one worked out wonderful for me.